The cartoon is from the Daily Mirror, 6 January 1967. In an art gallery, a man is pinned to the wall inside a picture frame. The caption underneath reads ‘… and then I thought to myself, what can I put in the exhibition this year?’ It’s a lame joke. But it seemed fitting in this extraordinary exhibition, in which intense blooms of sensation were prised from their original habitats and transplanted into the subdued environment of an art gallery. ‘Theft is Vision’ states the title of Bob Nickas’s collection of essays, published in 2007. That book, like the one featuring the Mirror cartoon, hangs by a wire from a wall-mounted art work by Matthew Higgs. Viewers are meant to pick up the books and read them. The structures at the other ends of the wires – a pink circular monochrome, in the case of the Nickas books, and an empty wooden stretcher for the book of art-themed cartoons – are so reduced as to seem almost perfunctory. ‘MHMMML’ looked, at first, like a tonally balanced and formally harmonious grouping of modestly scaled objects. (The title refers to the three artists’ initials.) Marlon Mullen’s paintings, velvety pools of vibrant acrylic on canvas, nodded to the colour fields of Higgs’s excised and framed pages. Margaret Lee’s assemblages take domestic objects – a mid-century bench, a planter stand – and augment them with her own sculptures. Tangerines and Bench (2013), for example, features realistically painted plaster citrus fruits beside the bench’s blue cushion. These are the kinds of acquiescent works that benefit from being displayed in groups. ‘MHMMML’, indeed, might best be understood as a kind of exhibition as art work. It is the third in which Higgs and Lee have collaborated (their word), though the first in which they have included Mullen. Significantly, Higgs and Lee are better known as a curator and an art dealer, Higgs as the Director of White Columns and Lee as co-proprietor of 47 Canal gallery, both in New York. This apparently even-keeled show soon began to heave and roll. A diptych by Higgs presented framed grey pages, together spelling out the piece’s sad title: Middle Age – Loneliness (2013). Nearby, from his Reading Painting #14 (Sam Kash) (2013) dangled a book called Surf Goddesses (1996). It contains page after page of black and white film stills of, in photographer Kash’s words, ‘youthful female beauty of truly transcendent dimensions’, or, put another way, candid shots of girls in bikinis. The black semi-circular painting from which the book hangs is no match for such heady material. Dennis Cooper, whose books Idols (1979) and The Tenderness of the Wolves (1982) feature in another of Higgs’s works, would recognize the larcenous quality of looking that Nickas refers to. His poetry admits the violence in sexual longing: ‘Kevin, should anyone ever / hurt you I will ruin them. / I don’t know you, / just see you with Carol when / she visits my roommate.’ Cooper’s words are fierce and hungry. It is a jolt to look up from his pages and blink in the cool even light of the gallery. The exhibition, it seems, is roiling with desire. Not only that but it is fuelled by words, objects and images not belonging to the artists, clicked into the show like supercharged batteries. 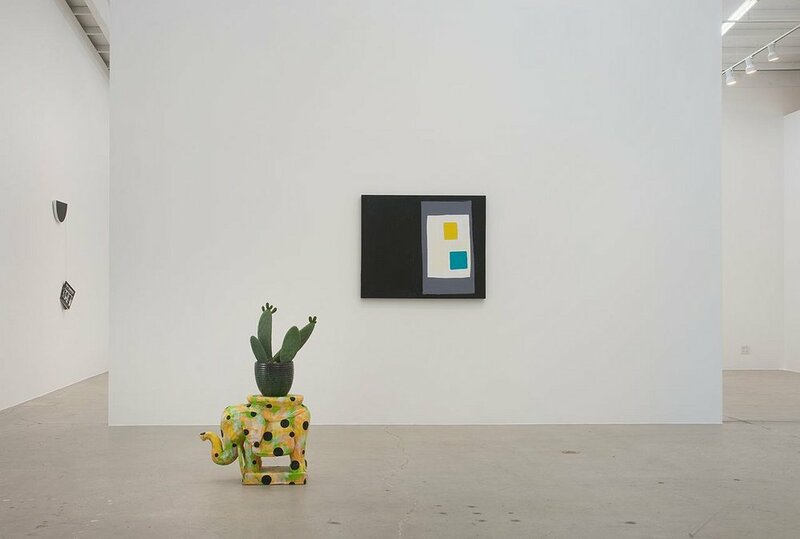 Lee’s ‘tbd’, (elephant and dots) (2013) includes a pot containing a prickly pear, apparently just snapped off another plant and pushed into the soil. It’s an apt metaphor for the other forms of appropriation in the show. And so to the bombshell: Mullen is a developmentally disabled artist who works at San Francisco’s NIAD Art Center. Perhaps this should be no surprise; Higgs is known for working with artists from certain Bay Area studios for disabled adults. Have Higgs and Lee then appropriated Mullen too? But Mullen’s work seamlessly aligns with the rest of the exhibition: he too steals images – usually torn, in his case, from art magazines – then transforms them beyond recognition. He is not like them but nor, indeed, are Higgs and Lee like each other. What ‘MHMMML’ proves is the insolubility of individual experience even when subsumed within a greater whole. Amen to that.